The Common Frog is an amphibian. Amphibians have been on earth for at least the last 250 million years. The name of this class of animals reflects the fact that while the adults are largely terrestrial, they must return to the water to breed. This is because the eggs are unprotected by a shell and would therefore dry out if laid on land. The eggs hatch into tadpoles which are very different from the adults. They undergo a transformation known as metamorphosis, in the process losing the external gills and tail which are adaptations for the purely aquatic life of this stage of the life cycle. Adult amphibians breathe through their skins as well as through their lungs. For this to be possible, their skin needs to be moist. The adult animals therefore require damp habitats and must avoid drying out or they will die. The Common Frog can be distinguished from toads by the colour and texture of their skin. Their skin is much smoother than that of toads and they have a brown patch behind the eye. Their skin tends to be more moist than that of toads, so they generally require moister habitats. Frogs feet are more prominently webbed than those of toads. They move about by hopping rather than by crawling, as toads do, and tend to be more active and to dash away upon discovery. Toads on the other hand are far more lugubrious and seldom indulge in rapid movement. Adult frogs are carnivores, eating insects and small invertebrates such as worms and slugs. They detect their prey by movement and have a long sticky tongue which can shoot out to grab the prey. They survive the winter by hibernating in the mud on the bottom of ponds. Frogs breed in shallow still fresh water, even spawning in puddles and ditches although ponds are preferred. 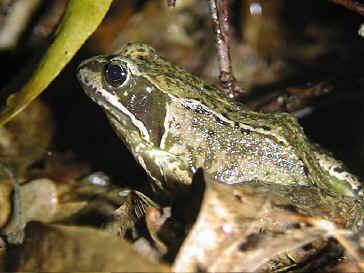 The adults of Common Frogs congregate in the ponds, where the males compete for females. The males can be very vocal when trying to attract a mate. (Common Frogs can even croak underwater.) Successful males cling onto the back of the female and fertilise the eggs as the female lays them. This process is known as external fertilisation. Frog spawning takes place, depending on the area and the weather, typically from the end of December onwards. Common Frogs lay their eggs (which appear as black dots), in clumps of jelly that float below the surface. The jelly swells up in the water soon after the eggs are laid. Spawn from several females may collect in one large mass. The eggs develop into tadpoles with a tail and gills. Later on, they will develop hind legs, followed by fore legs, and eventually the gills and tail will disappear, leaving a miniature adult. The young tadpoles are herbivorous, but gradually switch to a carnivorous diet as they mature. Huge numbers of eggs are laid, but few of them will ever reach adult-hood, as the tadpoles are on the menu of a large number of other animals, both terrestrial and aquatic. Adult frogs are also heavily preyed upon by other carnivores, including Grass Snakes, Kingfishers and Herons. 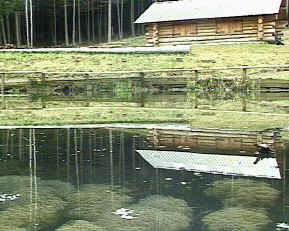 Above:Frog spawn in Dragonfly Pond at the Woodland Education Centre.